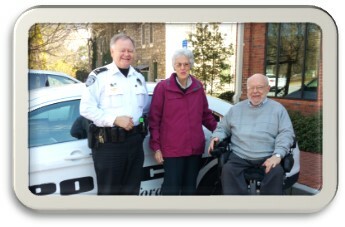 → Honorary Councilmember of the Month – Councilmember Smith has appointed Neil & Carol Penn as the honorary councilmembers of the month for April. We took them to lunch and gave them a tour of city hall, the police department, and the maintenance facility last Friday. → Tree Trimming – On Friday, March 6th, Arbor Equity structurally trimmed 40 of the descendants of the Yarbrough Oak along Wesley. If you look closely you can see one of their crew on the ground and one in the tree! 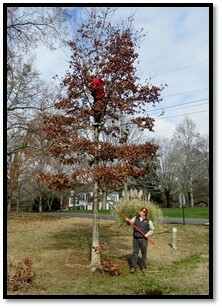 We issued a PO to Arbor Equity for $2,025 on the advice of the Tree Board and Beryl Budd. We received two prices and chose the lower one. → US Census Bureau – As part of the Emory-Asbury water line project, we had to fill out a one page survey for the US Census Bureau each month for the duration of the project. This was for its survey of construction activity. It is not so unusual that we have to complete a survey for the state or federal government. What is a little unusual is that the Census Bureau sent us a thank you note. → Court Clerk – As part of her duties as Court Clerk, Dawn Towns has to be certified to use the GBI Criminal Justice Information System. This certification requires ongoing training. Dawn recently completed and scored a 100% on the final exam for a long and involved GBI online training course. I’ve attached a copy of her certificate. 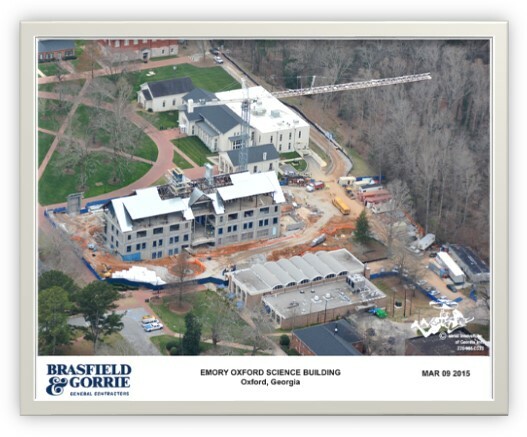 → Oxford College Science Building – I’m sure you have noticed that construction is continuing at a rapid pace. But you may not have seen it from the air. Every now and then the college posts an aerial photo.